The Windows Firewall stops harmful files (viruses, adware, spyware) from infiltrating your computer from the Internet. Change the firewall settings as needed to provide a balance between usability and protection. Broadband Internet users are especially vulnerable because their computers are constantly connected to the Internet. That increases the chances that hackers will locate them and try to exploit any available vulnerability. 1Choose Control Panel from the Start menu, click Security, and choose Security Center. The Security Center pops to action. 2Click the Windows Firewall link on the window’s left side and choose Change Settings. Click Continue or enter an Administrator account’s password if Vista’s permissions screen nags you. 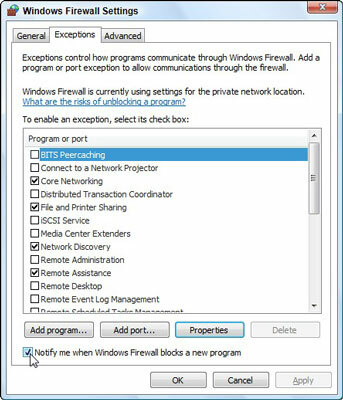 Make sure that the Tell Me When Windows Firewall Blocks a Program check box is selected. When a program doesn’t work correctly, that message lets you know that the firewall may be the culprit. 4Click the Add Program button, select the program (or click Browse to locate the program), and click OK. Almost all programs live in the Program Files folder on your C drive; the program’s name bears the same icon you see on its Start menu entry. The firewall adds your selected program to its Exceptions list and begins allowing other computers to connect to it.